BLACK MARKET WINE CO. Okanagan Falls, B.C. Small batch "Garagiste" winemakers (and Calgarians) Michelle Shewchuk and Rob Hammersley, hand-craft their award-winning wines in Okanagan Falls. Michelle and Rob source their grapes from Okanagan vineyards that are responsibly and sustainably farmed by growers who care as much about quality as they do. They believe that being small and nimble allows them to break the rules and craft inspired wines that are the result of unique collaborations with great growers. 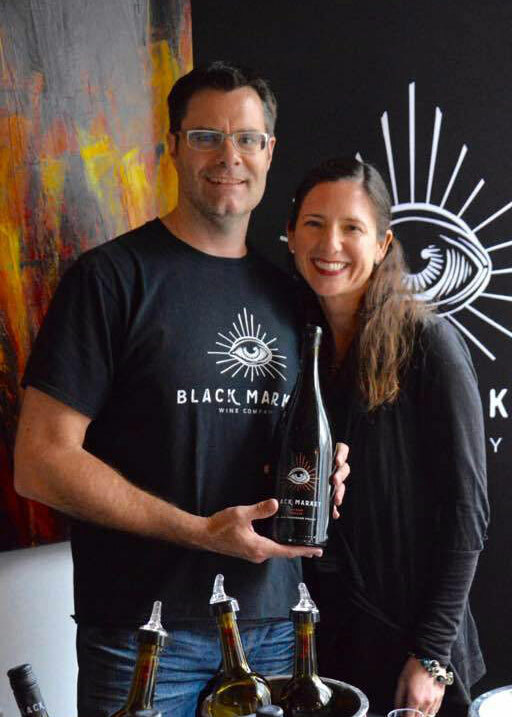 At Black Market, the goal is to make each wine with a strong expression of the varietal character, and with the least amount of winemaker intervention as possible. The vineyards from which they source their grapes are responsibly farmed by growers who care as much about quality as they do. From the moment the grapes are harvested and arrive at the crush pad, they delicately craft them in small lots, ensuring every single bottle of Black Market wine boasts exceptional quality and flavour.